The Ocean Ridges are submarine mountain chain formed by plate tectonics. In other words, it is an underwater longest mountain range in the world. It demarcates the boundary between two plates. It is a divergent zone where Ocean plates are born, spreading apart from the central valley, or axial trough. Here, we are giving the concept of Ocean ridges, how Ocean ridges are formed and the list of Ocean ridges around the world for general awareness. The Ocean Ridges are submarine mountain chain formed by plate tectonics. In other words, it is an underwater longest mountain range in the world. It demarcates the boundary between two plates. It is a divergent zone where Ocean plates are born, spreading apart from the central valley, or axial trough. The Ocean Ridge is formed when magma rising between diverging plates of the lithosphere cools and forms a new layer of crust. 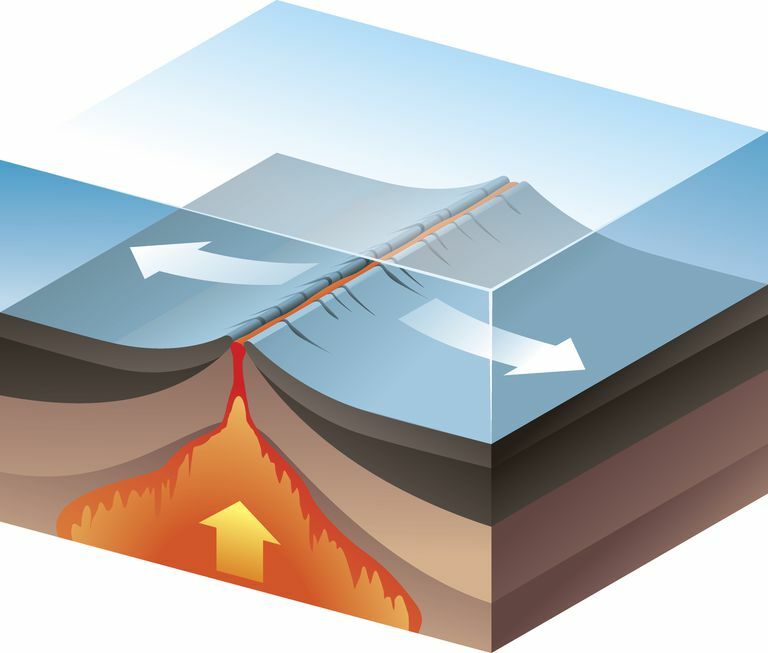 The uplifting of the ocean floor occurs when convection currents rise in the mantle beneath the oceanic crust and create magma where two tectonic plates meet at a divergent boundary. This uplifting is accompanied by two processes: Ridge-push and Slab pull. 1. 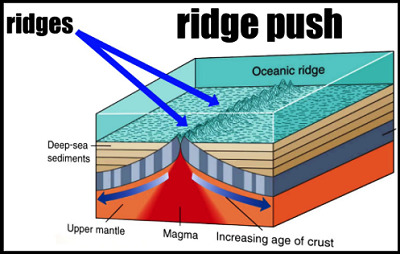 Ridge-push: It is a proposed mechanism for plate motion in plate tectonics. Gravity and heat expelled by the magma expand the lithosphere and asthenosphere at the ridge, pushing them the surrounding ocean floor. 2. Slab pull: It is the portion of the motion of a tectonic plate that can be accounted for by its subduction. This is simply the weight of the tectonic plate being subducted (pulled) below the overlying plate dragging the rest of the plate along behind it. 2. It is divergent boundary between the Somalian and the Arabian tectonic plates. 2. It is volcanic hotspot. 1. Located in the west of Vancouver Island, British Columbia, Canada. 2. It is divergent tectonic plate boundary between Vancouver Island, British Columbia, Canada. 1. Located at the northern coast of California and southern Oregon. 2. It is tectonic spreading centre broken into three segments- the northern ridge, central ridge and the southern ridge. 1. Located at the off coast of the Pacific Northwest region of North America. 2. It is a mid-ocean spreading centre and divergent plate boundary. 3. It separates the Pacific Plate to the west and the Juan de Fuca Plate to the east. 2. It is the tectonic spreading centre between the South American Plate and the Antarctic Plate. 2. It is a tectonic divergent plate boundary between the Nazca and Antarctic Plates. 2. It is a divergent tectonic plate that separates the Pacific Plate to the west from (north to south) the North American Plate, the Rivera Plate, the Cocos Plate, the Nazca Plate, and the Antarctic Plate. 1. Located on the edge of the South Atlantic and Southern Ocean. 2. It is a divergent tectonic plate boundary between the North American Plate and the Eurasian Plate. 1. Located in the Southern Pacific Ocean. 1. Located on the seafloor of the South Pacific Ocean. 2. It is a divergent tectonic plate that separates the Pacific Plate from the Antarctic Plate. 1. Located in the western Indian Ocean. 2. It is a north-south-trending mid-ocean ridge. 1. Located in the northern section of the Central Indian Ridge. 2. It is a divergent tectonic plate boundary between the African Plate and the Indo-Australian Plate, traversing the western regions of the Indian Ocean. 1. Located in the southern Indian Ocean. 2. 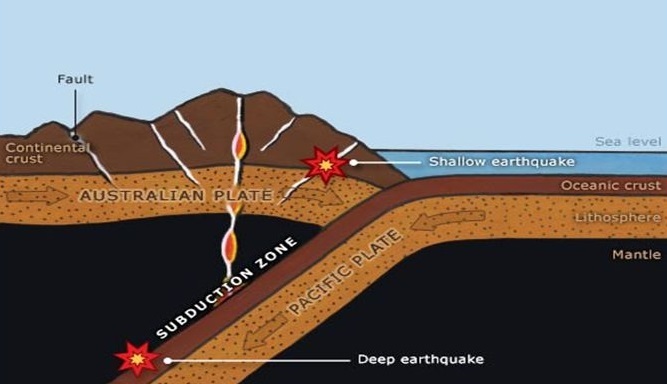 It is a divergent tectonic plate boundary stretching between the Rodrigues Triple Junction in the Indian Ocean and the Macquarie Triple Junction in the Pacific Ocean, the SEIR forms the plate boundary between the Australian and Antarctic plates. 1. Located along the floors of the south-west Indian Ocean and south-east Atlantic Ocean. 2. It is a divergent tectonic plate boundary separating the African Plate to the north from the Antarctic Plate to the south. 1. Located along the floor of the Atlantic Ocean, and part of the longest mountain range in the world. 2. It is a divergent plate or constructive plate. The Ocean Ridges are made up of elevated volcanic mountains and valleys, in general rising about 2000m from the adjacent ocean floor. It helped to establish the theory of plate tectonics in the 1960s.